People often tell me how they tried to grow edible mushrooms from a kit and either failed or the yield was disappointingly low. Other people tell me that growing edible mushrooms is extremely difficult and you have to do their expensive courses to be able to even have a chance to succeed. Depending on the type of mushroom, and your climate, growing edible mushrooms can be pretty simple. Some types of edible mushrooms are simple to grow, others are complex. If you are a beginner I suggest starting with one of the simpler types. I grew some oyster mushrooms on newspaper logs and some others just on damp cardboard. I recorded the days from inoculation to harvest here and here. It was remarkably simple and turned waste into food. It was actually heaps of fun. One thing I have noticed is that many beginners don't understand the words that people use when talking about mushrooms, so any advice they read tends not to make much sense. Fungi are not plants and they are not animals, treating them like either may result in failure. I have read many places say that fungi are plants without chlorophyll, this is incorrect. Fungi are more similar to animals than they are to plants, even when growing them I think they tend to react more like animals. When trying to understand the terms people use when describing fungi it is sometimes useful to compare them to plants or animals. This is simply for comparison. Like any analogy you reach a point where the comparison doesn't quite work. In order to successfully cultivate edible mushrooms there are a few simple things and a few terms you need to understand. Here are some useful terms that will enable you to understand what people are trying to explain. Mushrooms produce many millions of microscopic spores. Spores can be thought of as being similar to seeds of a flowering plant or the eggs of a bird. Much like seeds or eggs, the spores germinate and grow into a new organism and can display a lot of genetic diversity. Some spore grown mushrooms will produce huge crops and others seemingly unwilling to fruit at all. Due to this diversity some people rarely cultivate some types of mushrooms from spores and they tend to prefer cloning a variety that is known to produce well. Once a spore lands somewhere suitable it may germinate and grow. It then grows into mycelium which is made up of hyphae. Mycelium is the organism itself, much like a tree or a rabbit. This mycelium is the creature that you are trying to keep alive and convince to fruit for you. It is the fuzzy white (or sometimes coloured) stuff. When talking to my kids they refer to it as the ‘guy’ that we are growing. Mycelium is made up of hyphae. Hyphae are the threads that make up the organism, much like different tissues make up a tree or a rabbit. When you look at the fuzzy white mycelium it is made up of strands, these strands are called hyphae. If conditions are just right the mycelium will fruit, much like how a tree produces fruit which contains seeds. Mushrooms are the fruiting body of fungi, they can be thought of as being similar to fruit of a flowering plant but instead of seeds it carries the spores. The spores produced by this fruiting body are one way that a fungus can reproduce. This happens in nature and spores can be spread very far from the original mushroom. Fungal cells are totipotent, meaning that any cell can go on to create any type of cell. This means that you can theoretically break off any part of a mushroom (eg some hyphae, the mushroom stem, etc) and grow more mycelium which, if well cared for, will fruit for you. I say theoretically because there is a little more to it than this, but that is a topic for another time. Breaking parts off and growing them somewhere else is another way that fungus can reproduce. This happens in nature and normally results in short distance dispersal. Most people grow mushrooms from spawn. 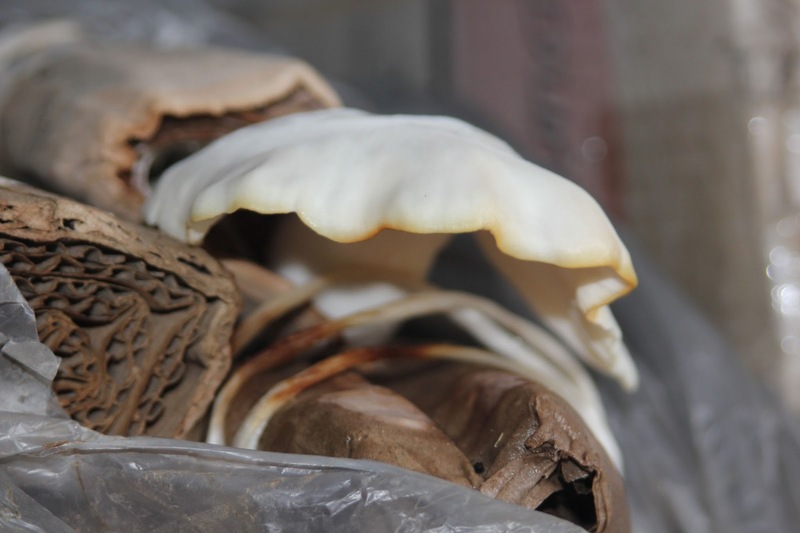 Mushroom spawn is some food source (grain, dowel, agar, cardboard, etc) that has been colonised by mycelium. Usually the spawn is genetically the same organism. If it were a plant it would be similar to a bunch of rooted cuttings all taken from the same shrub. I say usually because there are exceptions, but that is a more in depth topic. Colonised means the substrate has mycelium growing through it and living in it. Mycelium is grown on a substrate. The substrate is a word for the mycelium’s food source. Some substrates are better for spawn (growing more mycelium), others are better for fruiting (producing edible mushrooms), some are good for both. Different types of mushrooms require different types of substrate. When people talk about inoculating a substrate they are adding spores or spawn to a substrate. This is similar to how gardeners plant seeds or cuttings. After the substrate has been inoculated it takes some time until it has been fully colonised. Some mushrooms grow on logs, they fruit a number of times and when the log has been depleted of nutrients it will die. You can’t reinvigorate the log by trying add nutrients to the log by soaking in compost tea for example. 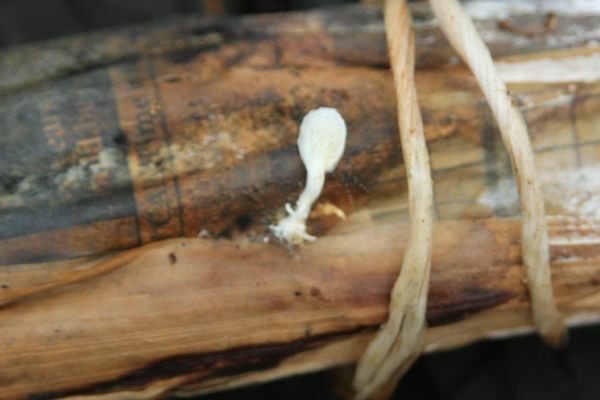 The mycelium will starve as it needs to digest the cellulose and other things in the timber itself. Once a log has fruited a number of times it will be noticeably lighter. At some point, depeding on the size of the log, it will start having tiny crops and then it will stop fruiting at all. Once your log has reached this point you can often use it to inoculate another log. I say 'often' because there are exceptions, but if you are beginner you are likely growing one of the more forgiving types.